CALL NOW FOR FREE A QUOTE! Hurricane Resistant Patio Doors, Impact Windows, Custom Entry Doors, Installation of Impact Doors and Windows in Miami | Get a Free ASP Windows Quote! For many, pets are everything. If you are a pet owner, severe storm weather can cause great distress, calling for proper preparation and understanding the forecast. Although some of these tips may seem like a no-brainer, others may surprise you. Make sure to read all the information thoroughly and follow them to ensure your pets are safe and sound! It is important that at critical times, you have all the necessary tools for your pets. Some of these tools include: leashes, carriers, and any types of toys. 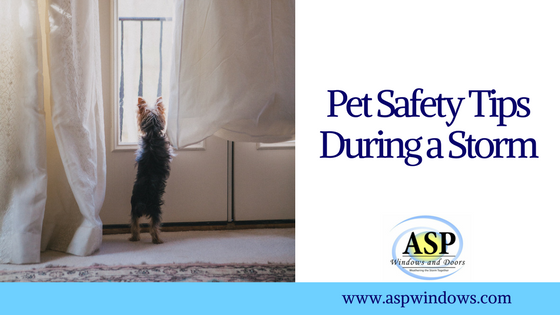 It is also essential to know beforehand where pets may be hiding during times of crisis, so that they will be able to be found easily, and quickly. Of course, make sure not to get so caught up with taking care of your pet, that you forget your own essentials, such as: hygiene products, clothing, water, food, books, medicine, etc. Ensuring that you and your pet have all the necessities for evacuation will guarantee that everything runs smoothly. A pet emergency kit is surprisingly similar to standard emergency kits. Food that doesn’t spoil, water, plastic bags, medical records, containers, and medicine should all be included in such emergency kits. Tagging and microchipping your pet will also enable you to find them, if they get lost. If you do decide to ride out the storm in your home, make sure that your pet does not have the chance to behave badly, in any possible chaos. This means keeping your pet leashed throughout the time of the storm, as your pet may be scared or anxious. Highly emotional events such as storms may cause hyperactivity, fear and anxiety. In turn, your pet may run around and cause a mess around the house, if they are not leashed. Powerful hurricanes, like Katrina and Irma, can be very distressing and may easily cause panic. Such storms are not only threatening, but are often unpredictable. Although it may be normal to panic or be in constant anxiety, this is not a good idea around your pet. Your pets can feel when you’re on the edge, and this may cause them to be anxious or upset. Try soothing your pet, and reassuring them that everything is under control. This is not only beneficial for your pet, but it will help you keep your cool too. It is easy to think we are prepared for the storm, but it’s important to stay sharp as challenges may arise. If there is a need to evacuate, don’t hesitate and make sure that you have the essentials for you and your pet. Staying calm around your pet is essential to maintain a stable environment. Precautions should be taken before, during, and after the storm. Give us a call today, should you need help preparing for a storm coming your way. When Does Hurricane Season Officially Start? Can a Hurricane Blow Out a Traditional Window? How Do Hurricane Windows Affect Ventilation? Are Hurricane Windows Too Expensive? Can You Tint Impact Windows? ASP Windows is one of South Florida’s premier impact windows, impact doors, impact glass, and hurricane protection contractor. We specialize in retrofit and new construction installations of residential, commercial, and high-rise projects.